This is a traditional American Steak house. 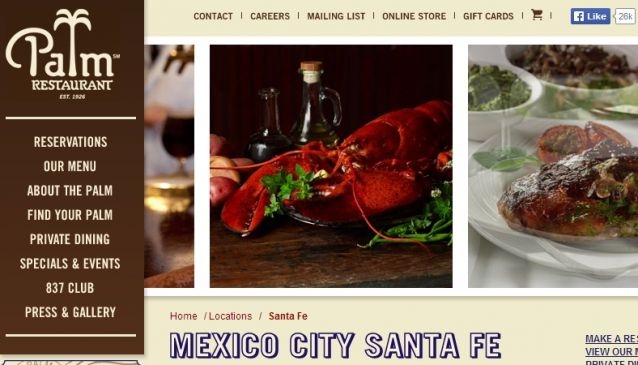 Located in the Intercontinental Hotel in Santa Fe and also in Polanco.Where you will enjoy a unique experience, along with a friendly and attentive service.Among their specialies are the crab cakes or lobster bisque and of course different types of steaks cuts. Also offer Salads, Italian classics.Their portions are generous and also offer variety of wines. Recommend place to have Bussines and Family reunions.On the weekends they offer a special children buffet and they even offer child care with specialized staff. Their dessert menu also offers traditional american desserts, such as the hot apple pie, cheesecake and ice cream.